Many of you will know this classic board game that had first appeared 25 years ago. It was released in 1986 by Ravensburger, and it consisted on a solid board and a lot of moving parts that formed the puzzle. The goal was to advance through the maze, collect some treasures it contained, and return to the initial position. The Android version of The aMAZEing Labyrinth that has just reached the Play Store maintains the original idea of the game. We will move through the labyrinth, got the treasure and get out of the maze. To do this, we need to reconstruct the path, fragmented and scattered along the grid. However, moving the pieces is not trivial, since we have only a certain type of movement allowed (such as moving entire rows or columns). 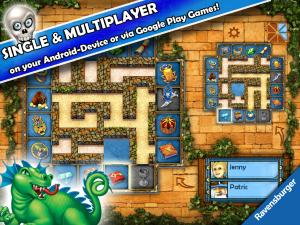 There are three game modes: classic, puzzle and duel. In the classic mode, you can play alone or with more players, up to four people. The games can be played on a tablet itself or there is also the possibility to play online through Google Play Games. The puzzle mode, however, challenges us to get through the levels with the fewest possible moves. The duel mode has a slightly different format. In it, we face another player, with which we come face to face on a board. In the margins there are 16 treasures and who gets the first 8 of them wins the game. The way to get around is the same of any typical sliding puzzle, in which there is only one free box that need to be moved to create a route. All the game is a race against time. 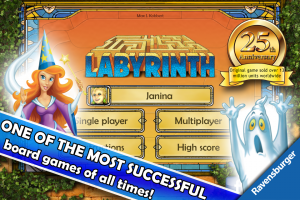 The aMAZEing Labyrinth is available for devices running Android 4.0 or higher and you can download it for only $3.99, a small price for a game that ensures hours of fun in family.